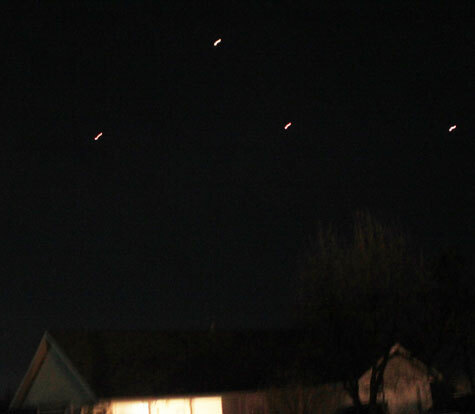 At around 8:30 PM my wife and I observed between 7 to 8 fireball like lights in the sky. The first light was maybe a mile or so in front of the second set of three, then a 4th and 5th and then a 6th and 7th came from the west. They traveled East for a few seconds then began to turn upwards and south and faded quickly. There are no airports in that direction and we couldn’t hear anything (i.e. a helicopter or plane). They were low enough that had they been a plane or helicopter we should have been able to hear engine noise. They also flew in the same flight path. They were in a straight line and then the set of three split into a triangle pattern before fading away. They were all red and flew in a straight line. I wasn’t able to get a good photo of the objects. I didn’t have time to set the camera for night photos and didn’t have my tripod. The objects were round. Ancient Cave Drawings; Carvings & Sculptures; Paintings & Tapestries, and Books & Illustrations found all over the planet. Illustrations from a 12th century manuscript Annales Laurissenses, a book that documents historical and religious events. These illustrations refer to a well-documented 776 .